Lenovo Z5 Indigo Blue Edition Will be Available for Buying from Tomorrow - Playfuldroid! At the beginning of this month, Lenovo had introduced the Lenovo Z5 mid-range phone. It was introduced in color variants like Schumann Black, Indigo Blue and Aurora. However, the company had only made it available for buying only in Schumann Black color. Today, the Chinese manufacturer has confirmed the arrival of new color variant called Indigo Blue for the Z5 smartphone. 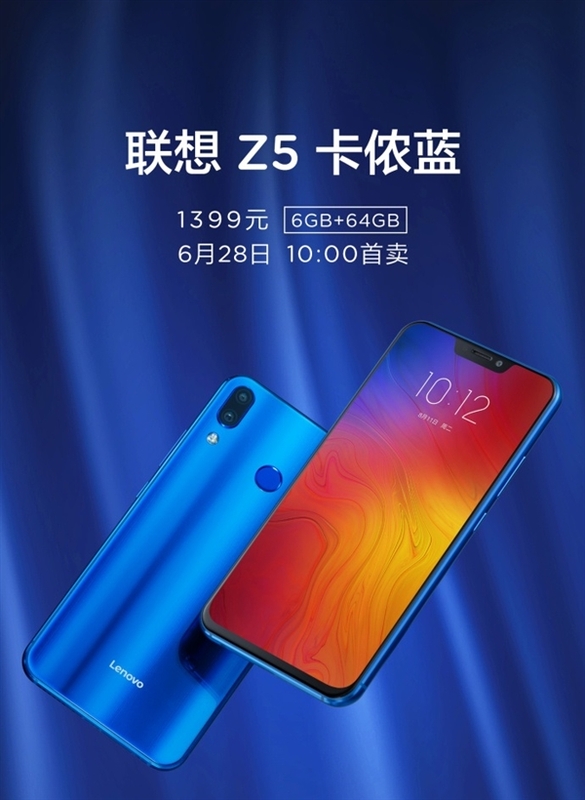 As it can be seen in the above poster, the Lenovo Z5 Indigo Blue will be available for buying from June 28 at 10 AM (local time) in China. This variant will be featuring 64 GB of storage and 6 GB of RAM and it carries a pricing of 1,399 Yuan which is 100 Yuan more than the regular pricing of 1,299 Yuan for same storage and RAM variant. The Indigo Blue edition of the Lenovo Z5 appears quite impressive as the metallic frame of the phone also features the same color. This makes the new blue variant more attractive than the existing black model. The Lenovo Z5 features a notched IPS LCD screen that produces 18.7:9 aspect ratio and offers FHD+ resolution of 2246 x 1080 pixels. The Snapdragon 636 chipset is present under the hood of the phone. It comes in a higher model that features 128 GB of storage and 6 GB of RAM. The other features of the Lenovo Z5 include 16-megapixel + 8-megapixel dual camera, front-facing camera of 8-megapixel and 3,300mAh battery.